We got some nice rain here today- mostly wet all day. I tried to get a picture of a little house wren, but he wouldn't cooperate. Around dinnertime I looked out the kitchen door, and look who was getting ready to have a snack. These photos are not touched up at all. They are taken through falling rain, with the camera lens all the way out. But I think the second one nicely shows what this large doe was after... apple leaf salad. One more post from Monday's adventure. 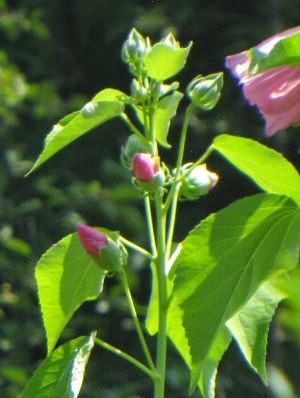 Right now, the wild hibiscus, Hibiscus palustris, is in bloom. 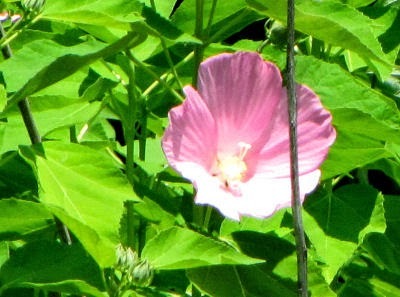 It's also called Swamp Rose-Mallow. This is a huge plant, maybe 5-6 feet tall, and the flowers are 6-8 inches across. 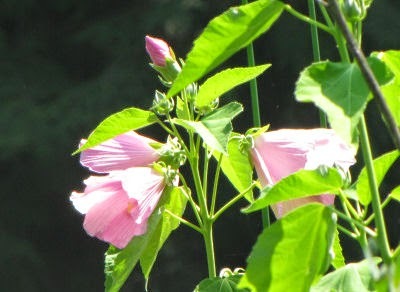 Like any hibiscus, it has that long style protruding from the center of the flower. It's odd in that it will grow in brackish water... along the seashore in tidal swamps, but also in freshwater marshes, particularly in the Great Lakes Region. Here we are! Here are the buds, which are not bad looking themselves. Now I can give you an answer to the duck mystery. I have to confess it was a mystery so long because I misplaced my bird book. Several of you gave some good guesses. Theresa, Ratty and Auntie E all correctly searched out the answer. 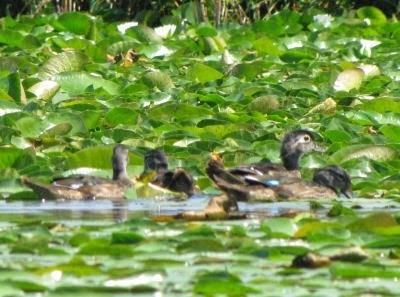 It is a female wood duck, with (I'm pretty sure) three juveniles. In real life it was much easier, both by relative size and behavior, to see this as a family group. In fact, this picture is almost an exact match for the one in my bird book. Male wood ducks are pretty spectacular. Maybe some day I'll get to show you a picture of one. And a P.S. on the heron. Yes, these crazy birds are at home in trees. They build huge nests of sticks on the tops of dead trees. I already knew that. But I had always mentally pictured them sitting up there with their long legs folded under them. They probably do when sitting on the nest. But I never for a minute thought that they could balance those big bodies straight up and down! I know where there used to be a rookery (a group of nests), but I think the birds moved on. Maybe I'll try to get there and see if I can picture a nest for you. Did you try to find where the bird was in the picture yesterday? A couple of people got it... rainfield was creative and said it flew away! If you haven't tried to find it, it's too late now! Can you see it now? This was a first for me- sort of. I knew these birds land in trees. They even nest in trees, but I've never seen one in a tree close-up. I had no idea that a great blue heron- a bird that is about four feet tall, could perch upright on skinny branches. Just look at it! That must be quite a feat of balance, too. See the feet? It can actually bend its toes around the branch like any small bird! I'm really glad this one focused pretty well. Finally it hopped to another branch, and there was more sun and color in this background. I watched it. It watched me. Then Ellen and I paddled away and left the heron in peace. For a little humor... two guys in a fishing boat passed us just before we got there. 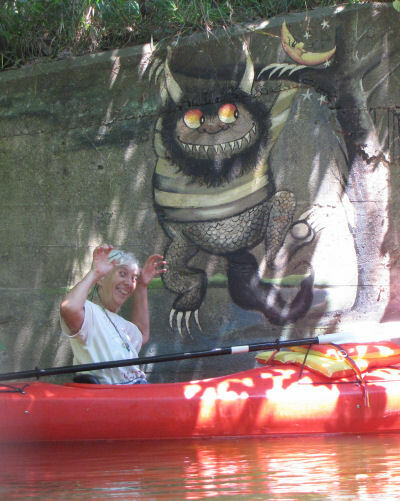 One of them said, "There is a loon on your left, up ahead." Ellen just rolled her eyes. She knew they didn't mean it. (There are a few loons in our county all summer, but most of the water is too warm for them to stay past spring.) I think they must not be nature buffs, if they can't tell a loon from a heron. Three bird photos for you today. The first one we know. Mama swan and baby cygnet. Now here's your assignment. Find the bird in this picture. Tomorrow I'll show you. No, you can't make it bigger. That would be too easy. Sorry. And this one isn't really a game. I'm not all that knowledgeable about waterfowl, and I can't figure this one out. It might be a group of juveniles which would make it harder to identify. So if any nature lovers recognize these guys, let me know, ok? I should be working 24 hours a day on this media program, but Ellen and I had made a "date" for an adventure long before yesterday. Besides, we had to finalize the picnic plans for the big Aug 3 day. 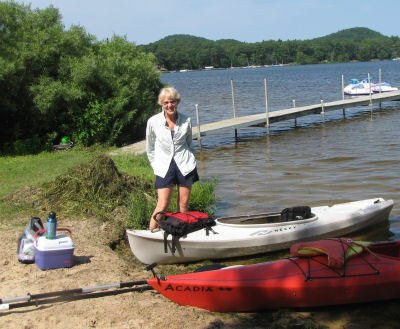 We kayaked across Bass Lake, to Lake Michigan, had a picnic lunch, swam for maybe an hour, and kayaked back. The big lake was warm! Well, ok, there were cold spots, but it was amazing. There was just enough wave action to keep the horizon in and out of sight. Very relaxing! There was a sailboat race on Bass Lake. 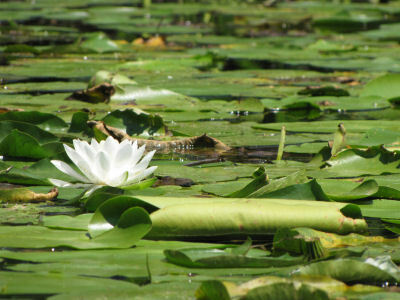 I know that this picture is trite, but water lilies always seem so peaceful. It's hard to get tired of them. The next one isn't so ordinary. Do you think I'm a wild enough thing? And I got some pictures for a little game for tomorrow. It involves birds. Come back and play! Thank you for the prayers for Betty's family. Sam died last night, so the timing was perfect. Bess is on the left and Marie on the right. I know I haven't really introduced Marie, but you've seen her in lots of hiking pics. I should probably give her a complete entry. But today we'll do Bess. Her full name is Elizabeth Arden. Really, I'm not pulling your leg. The famous Elizabeth Arden was a cosmetics magnate, but ours goes by Bess, and she's famous enough in our small circle. She joined us in 2000 on a hike of 106 miles in western NY. She is a long-time friend of Marie's. Marie worked with kids with disabilities most of her career, and met Bess, who works with people with low vision issues. I think she helps them find resources for work and independent living opportunities. Bess was at a point in her life where she wanted to take on a physical adventure that was a significant challenge, and she wanted to do so with other women. Somehow, Marie and I qualified (grin). That hike was one of the most difficult of any along the NCT with a never-ending series of tall hills with trail that just went straight up and down again. This section is part of the Finger Lakes Trail and their nickname for it is "The Western Wall." We hiked in early July and it was hotter than any of us would have liked. Despite the challenges, Bess never complained.
" Bess has been our early riser. Often she is outside doing exercises before even Marie is awake. She stretches and bends 'to get the tension out.' It's fine if it works for her, but if someone tried to force me out of a warm sleeping bag to exercise with the birds I'd be too tense to spend the day with.! She has also turned out to be a companion with a great sense of humor. She adopted a stick with a Kokopelli silhouette and named him George. George traveled with us for several days until he lost a leg. Knowing that this would make it difficult for him to hike (not to mention making it difficult to distinguish him from the other sticks in the forest), we sadly bid him adieu and gave him a proper hiker's burial." From chapter 53, "May the Road Rise to Meet You." I will get a post up every day this week, but may have to back off on commenting on your blogs as much I would like. I have to get this media finished, and there is way too much to do yet. That's a deadline that can't be fudged. One piece of sad news. Although you haven't met her, I have another good friend named Betty. Her husband was diagnosed with cancer last fall and I found out today that they called in Hospice on Thursday. She and the family have been totally focused on his care for the past 9 months. She said in an email, "Sam's time to grow wings is coming very close." I feel so bad for her. They are not much older than I am, and were high school sweethearts. I've rarely encountered a couple that were so much in love after 50 years of marriage. If you are one who believes in prayer, just say a quick one for Betty tonight, please. I've been working all day on the new media program about the trail. This project is turning out to be even bigger than I expected. Read... HUGE. I haven't actually added up the number of pictures I have from the past 20 years of hikes, but it's something over 10,000. I'm trying to pull together a sensible number of them to give people an idea of the trail, without duplicating too many from the program I've been using for quite a while. Read... I'm busy. Maggie got a walk, but I even forgot to take the camera. So, you get a picture from 1996. I like this one. It shows what some of the "hiking" in the Adirondacks is like. We were scrambling up the rocks to get through Indian Pass which runs beside Wallface, the second highest sheer rock face in the eastern US. That's the Chipster already on top, of course. I'll plan on introducing another fellow hiker tomorrow. Stay tuned. Yesterday we had quite a storm move through here. If wasn't much compared to what people a bit south of us experienced, but it's the most interesting thing that happened. Here's the view from the lower level door. Or enjoy a short video! I'm surprised that you can't see the rain in the movie, because it was sure coming down. Meet David. He's the cutie on the right. The other little guy is my Steve. 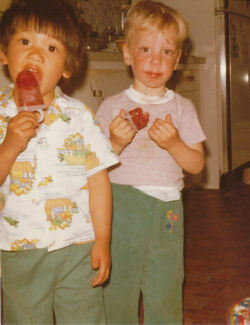 Yup, this was a while ago, 1978 to be exact. But this was the year I met David. His mom is my best friend and hiking buddy, Marie. Dave, unlike Steve, really enjoyed camping and hiking. By the time he was a senior in high school, he went on a camping excursion with Marie and me. He didn't think that it was weird at all to go camping with two adult women. So the next year, when we took our first long hike on the NCT, in Pennsylvania, Dave went with us. 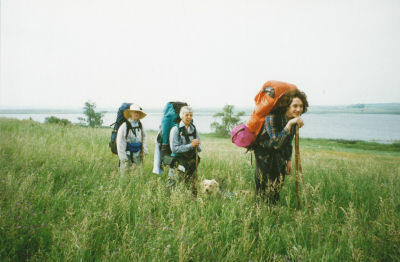 The next year, in 1995, Marie, David, Mathilda, Chips and I all went to North Dakota for our first hike at the western end of the trail. Can you feel the wind? The next year, we girls went to the Adirondacks of New York. Dave needed college money, and had to pass on that trip. He was crushed, since big rocks are one of his loves. 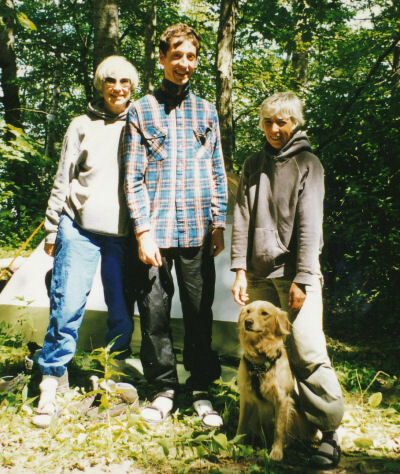 But in 1997 he joined his mom and me for a trek through the Chippewa National Forest of Minnesota and for some serious bushwhacking. By then, he had met Rachel, the girl who was to be his wife in just a few more years. Where is he now? He's our Philadelphia connection, where we all go to stay when we go to the Flower Show. He and Rachel have two little girls, Anja and Mia, whom you have also met before. This last picture isn't very good, but I guess it's the best I can do for a current shot. 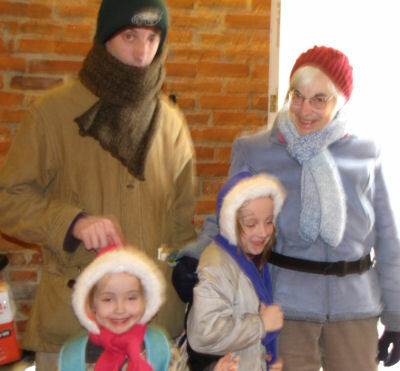 This is a Monday morning on the way out the door to walk the girls to school, so everyone is bundled up. David is the tall one with the scarf (in case you can't tell- haha), Marie is on the right with Anja hugging her. Mia is in front of David. David definitely holds one of the special spots in my heart. He's a computer programmer, and customer support rep. Oh yeah, and a great dad! "A solidly built man in jeans, brown work shirt, red suspenders, and an engineer's cap grins impishly from under its brim. With a slight European accent he greets us... The garden tour is first. 'Radishes came along better last year. Tomatoes are lookin' good though.' He draws David into his confidence, showing him stealthily the mechanism to control his underground irrigation system. 'Now I'll show you my winter hobby. You ladies go in the car. The young fellow can ride in my truck.' It's hard to be offended, to accuse him of being sexist. He seems to treat it all as a joke, but one that we can be in on if we want. In a world where he is confronted with the reality of three women and a just-past-boy who are planning to camp alone for two weeks, perhaps he must find a bit of security in the old ways." From chapter 6, "Where the Trail Begins." See Look Where I Am! I know, I promised to introduce my friend, David. No, David is not a bush. But I just got involved in working on the new media program for Aug 3, and didn't get the right pictures scanned for this post. Then we had a little panic with getting an audio file converted to a format that another friend can work with to do some tweaks for me, and the phone kept ringing, and... you can see how my day went. But I got a lot done, just not the pix of David. Anyway, this is just a lonely, stressed blueberry bush growing on top of a sand dune at the spot where Marie and I ate our last Lake Superior lunch on the Marquette hike. I like it, that's all... so I thought I'd share it. Have a great day! Supposed to be even hotter and more humid here. We have fans running everywhere. I just had to use this for today. On a quick run through the house I glanced out the window at the right time and saw the sun on this cloud. I'm not a big fan of pink, but in the right setting it is cool. And I mean cool in temperature. This is not a "hot" sunset, but really speaks of a cooler ending to the day. Cooler, of course, is relative. It's 76 instead of 86. I'll take it. Tomorrow, you will meet David, another hiking buddy. It was interesting to me that each of the plants had at least one guess. Let me tell you about the others first. The Big Bluestem is a native prairie grass that is actually very desirable. You might not want it in a garden, but I'm SO glad that there is a big patch of it filling in the field. It's tall- 6-7 feet. The mistflower is native to the US. It does not seem to be a pest in our area. Actually, I've only seen it a couple of places other than in my field. I'm amazed at how happy it seems here. I transplanted some to the east side of my house because it seems able to take the hot morning sun bouncing off the house. Most interesting was Julia's response. She really knows plants, but I think each of us would be lost in the other's home space. She identified it as Himalayan Blackberry, a genuine invasive pest in the west. I don't think we have that one here yet. This is probably Rubus hispidus, although they hybridize. So we are left with the Spotted Knapweed. Betchai call it right. She's looking like a bit of a plant expert herself with two correct IDs in the past week! Why is this such a bad plant? There are several reasons. 1. It is not native to the US, but to Eastern Europe. When plants are moved to spaces where they were previously unknown they tend to either die out or become aggressive. This is because all of the natural checks and balances don't usually come with them, such as insects or animals that eat them. 2. It has a long tap root that outcompetes other plants for water. Anyone who has tried to manually control this plant knows how difficult it is to pull up. You really can't get it all up unless the ground is moist. 3. It produces a LOT of seeds. Once the spotted knapweed gets started in an area it will soon be found everywhere. 4. It tends to be passed over by grazing animals. It is less palatable than many other plants. 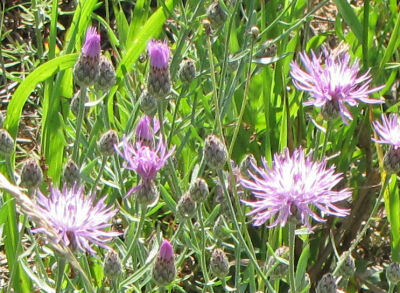 Cows, deer, rabbits, etc will leave the spotted knapweed and preferentially eat other plants, leaving the knapweed to propogate. 5. There is some evidence that it is allelopathic. This means that it can exude chemicals that inhibit the growth of other plants in the vicinity. Just about the only way to eliminate this plant is to get an army of people to pull plants on a regular basis. This is a never-ending job, so except for perhaps small areas, it can't be eradicated. My point of this post is to remind everyone that there are invasive plants where you live! Learn how to recognize a couple of them, and do what you can to prevent their spread.